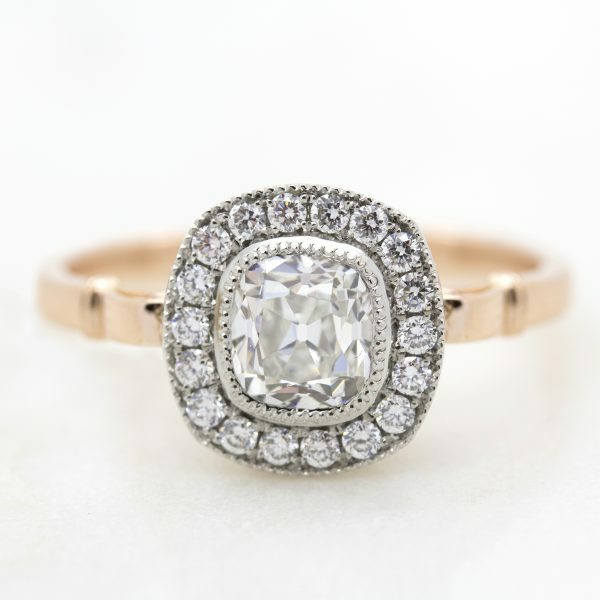 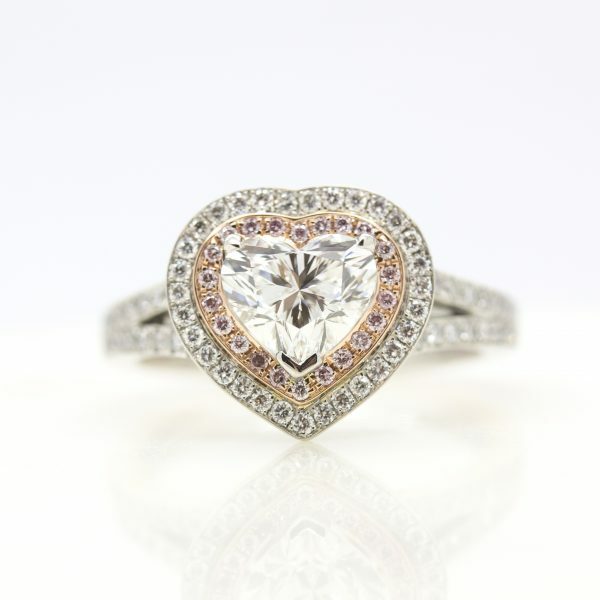 At Taylor & Hart, you have the opportunity to co-create an entirely unique, one-of-a-kind engagement ring. 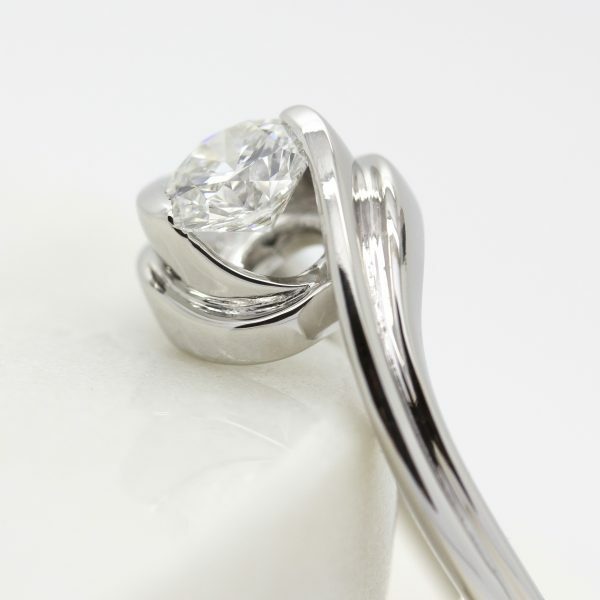 From the very beginning you are directly involved in the design process alongside your dedicated personal design consultant. 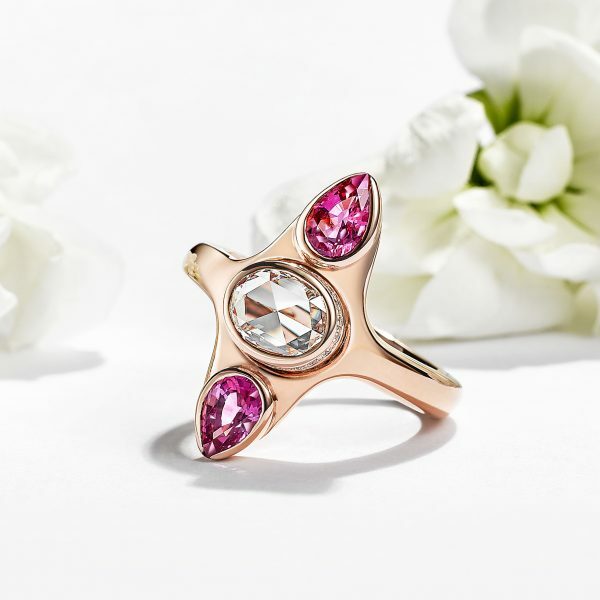 Based on your tastes, price point, preferences and style, you can create almost anything–from organic inspired rings to floral designs, representations of places and even animals, we have designed them all. 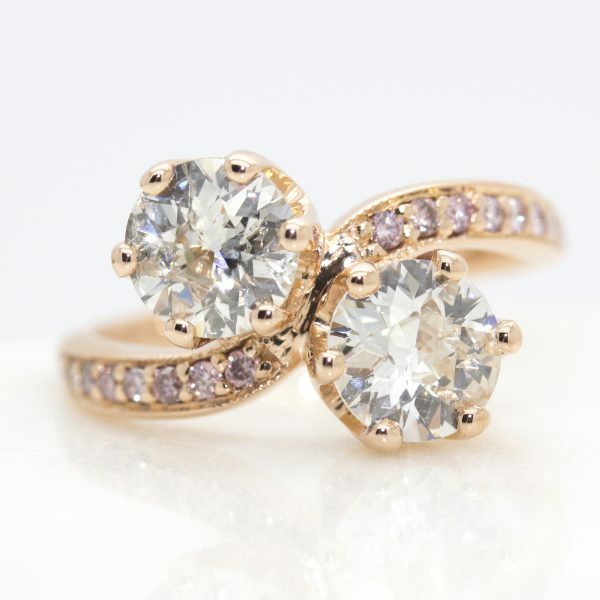 Over the years, we have designed hundreds of beautiful, unique and unusual engagement rings to symbolise love stories around the globe. 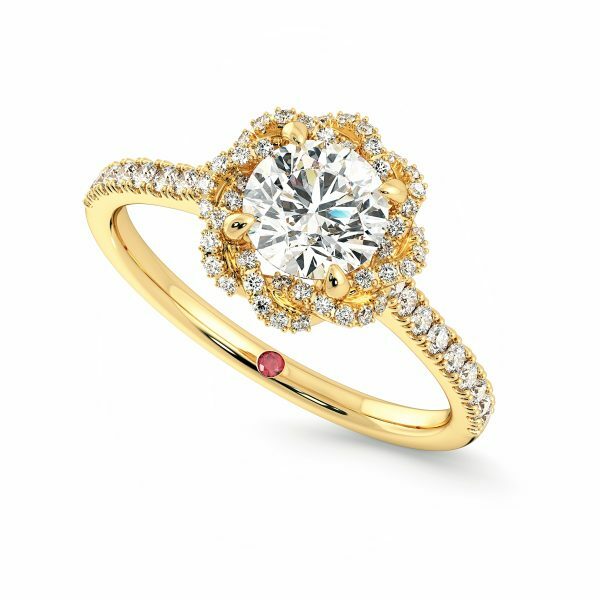 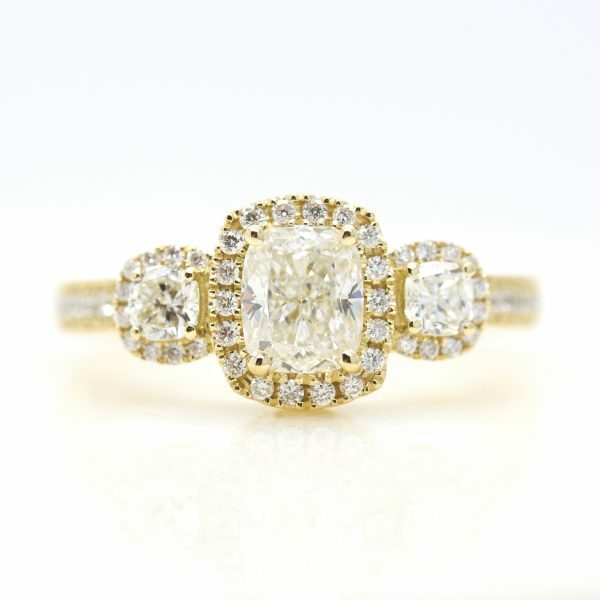 Browse through a selection of some of the unique engagement rings we have designed and crafted. 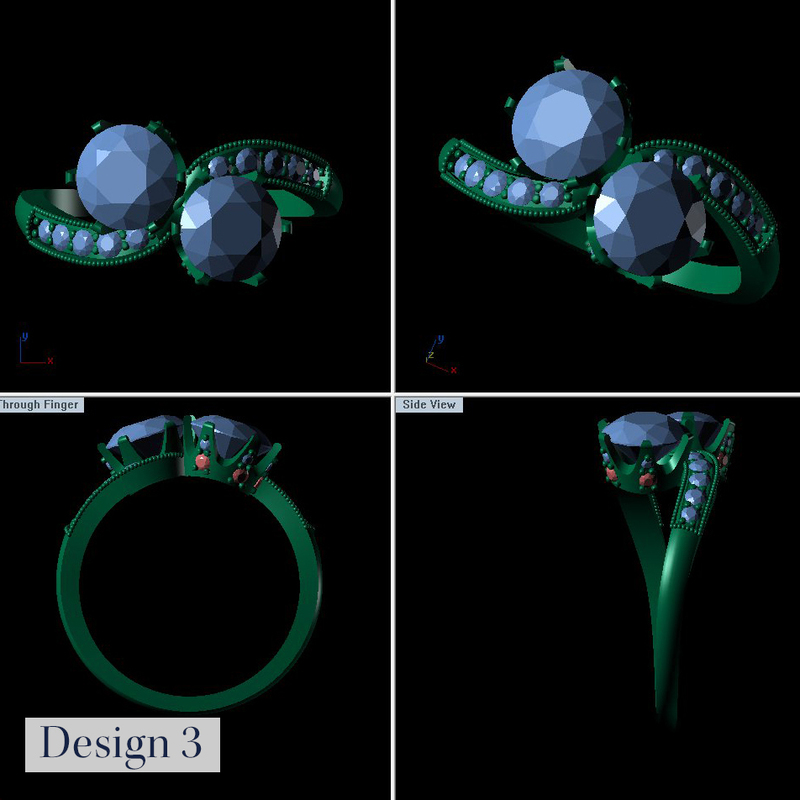 how unique can a design be? 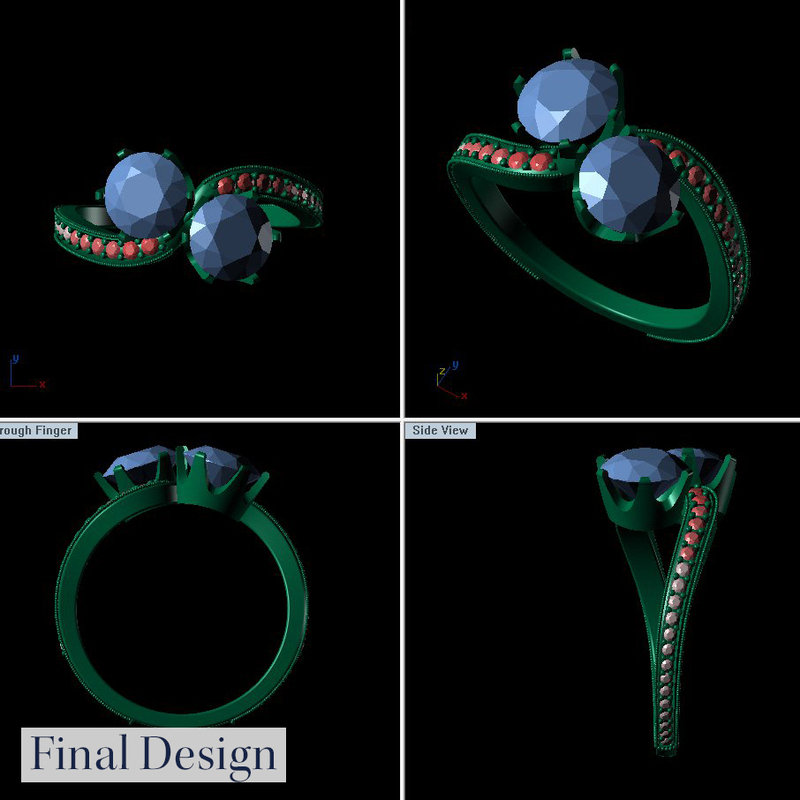 Whether you take inspiration from designs gone by or you have ideas of your own, our custom design service will bring your ideas to life while we guide you through the process. 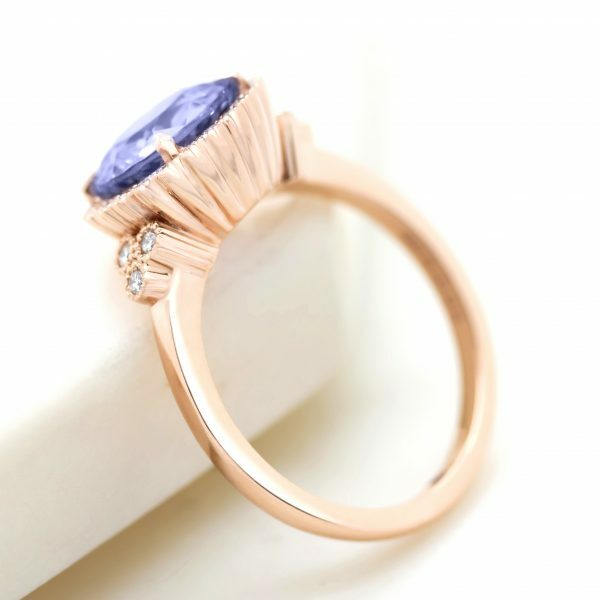 There is such a wide range of ‘unique-ness’ when it comes to custom engagement ring design, but it can usually be sorted into three categories– a small design change to a collection design, a customisation to a design and entirely bespoke ring design. 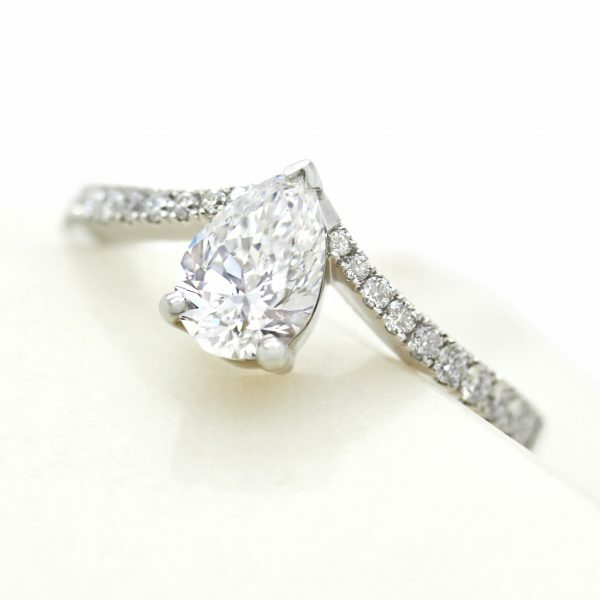 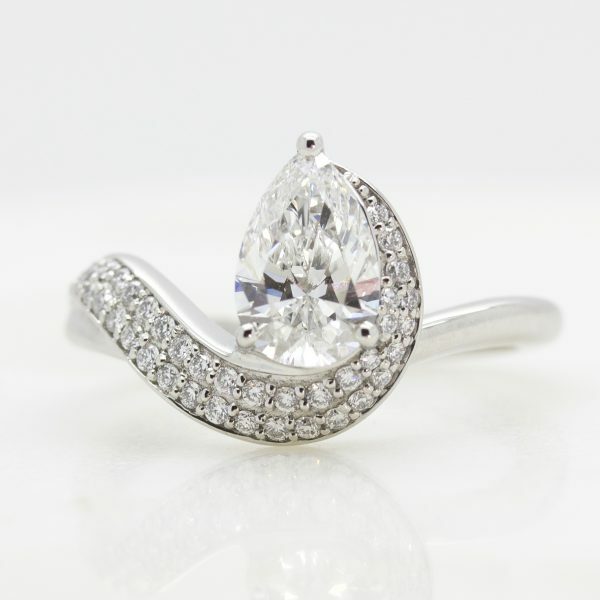 We offer a collection of ready-made engagement ring designs which you can choose from. 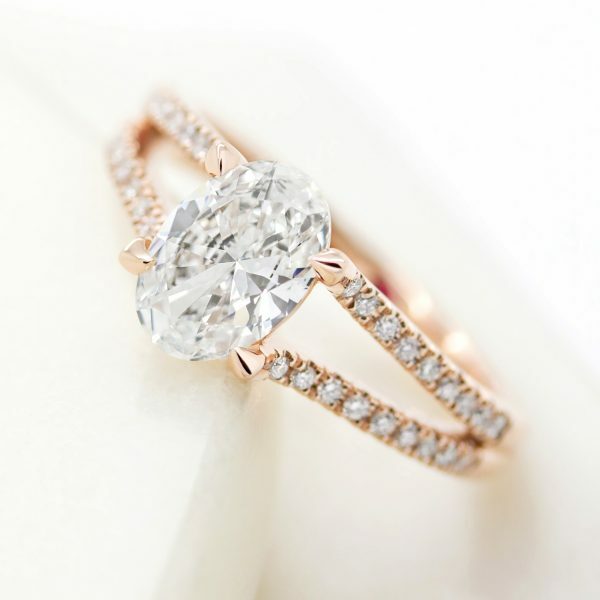 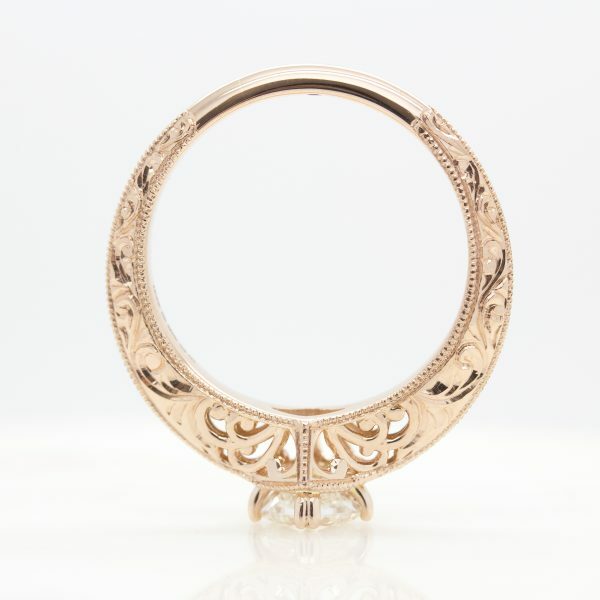 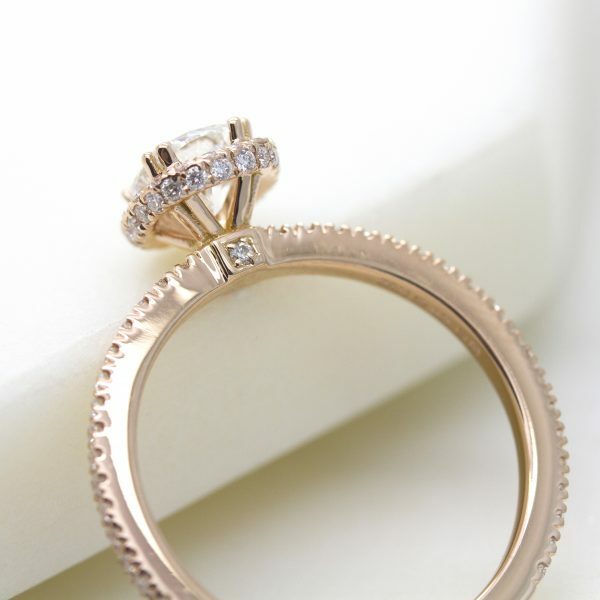 If you find the perfect design but don’t want a ring the same as every other customer that has selected the same design before you, there are plenty of ways to make a small personalization to your design to make it entirely unique. 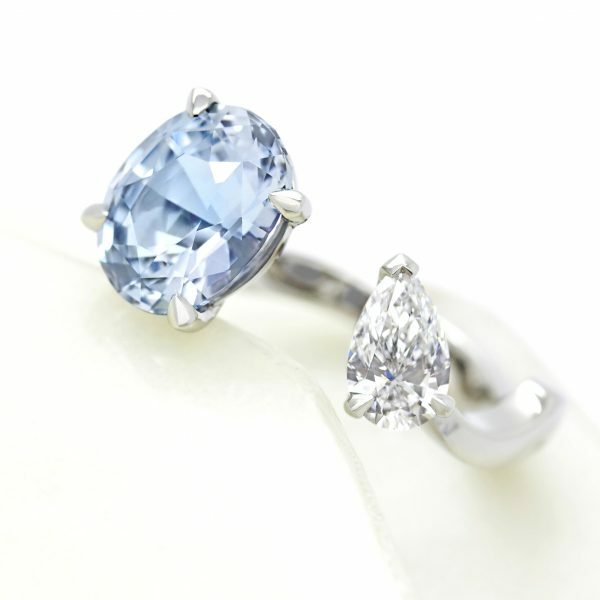 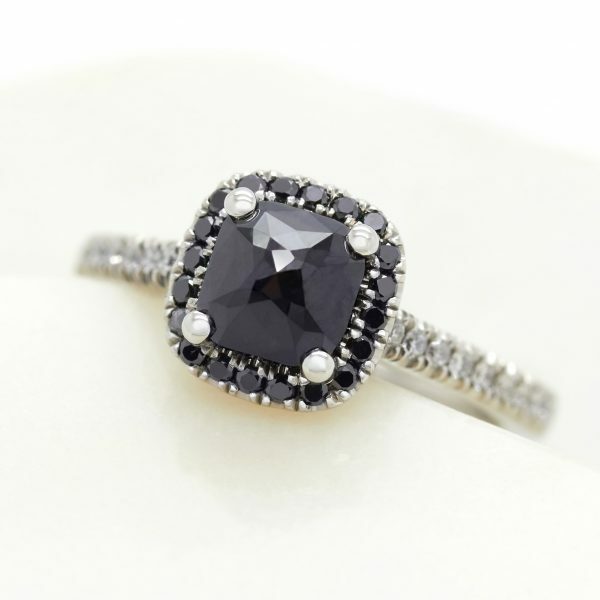 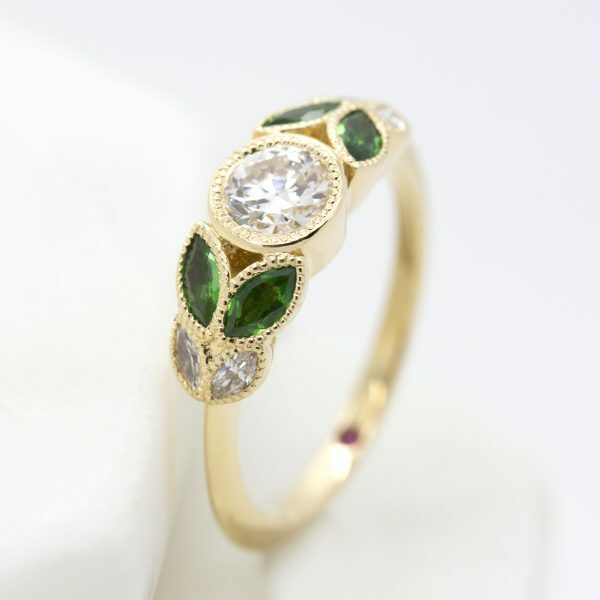 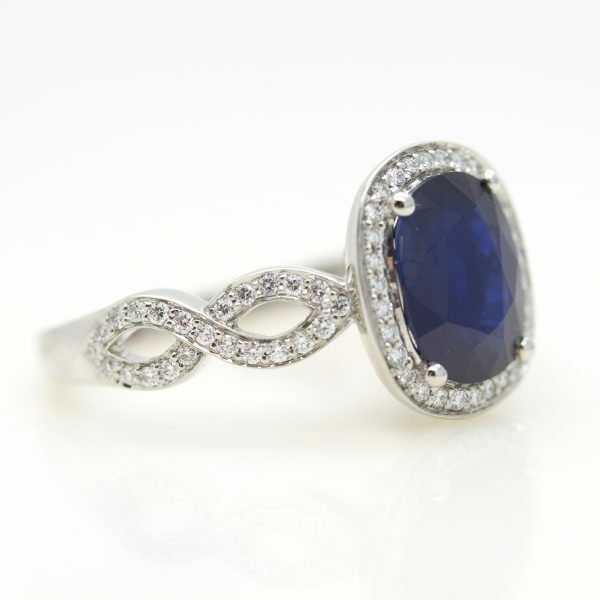 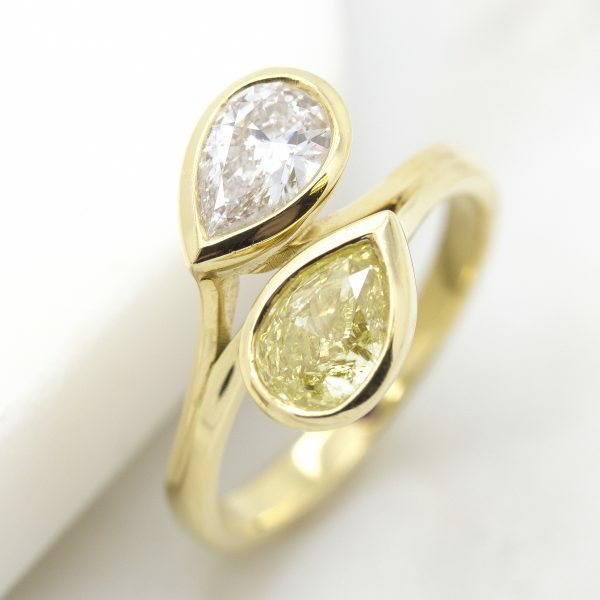 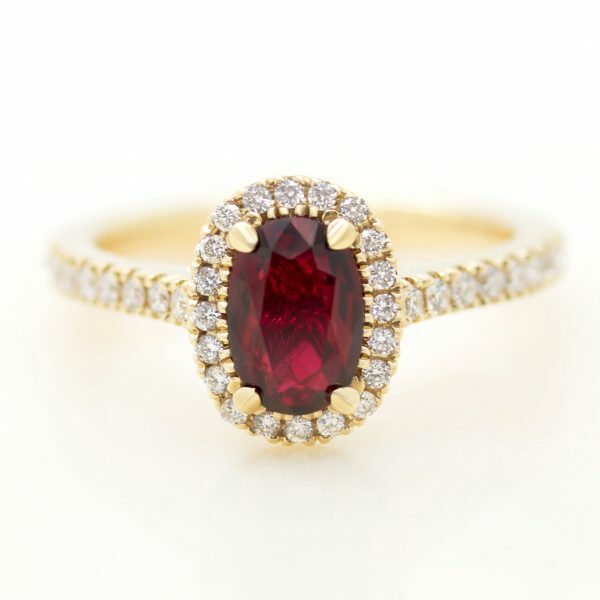 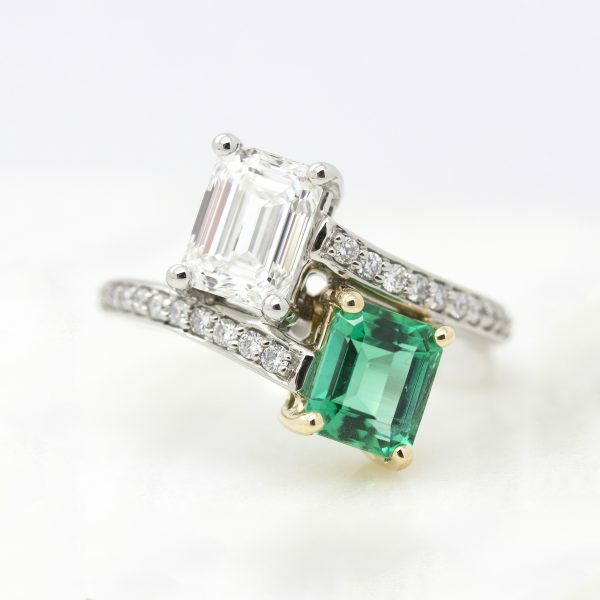 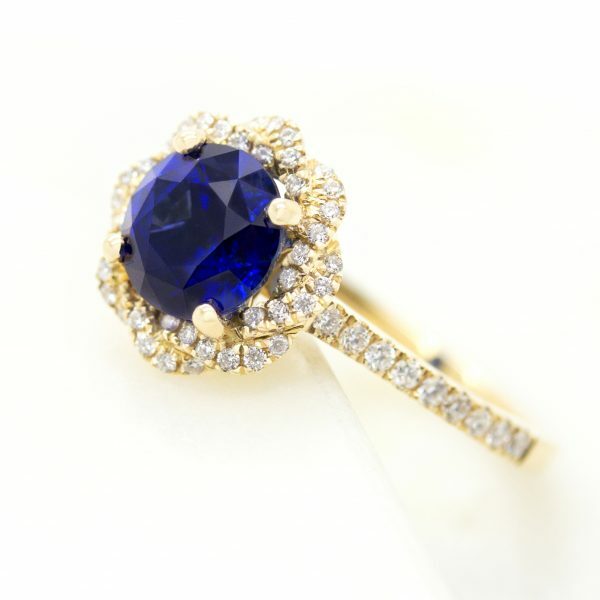 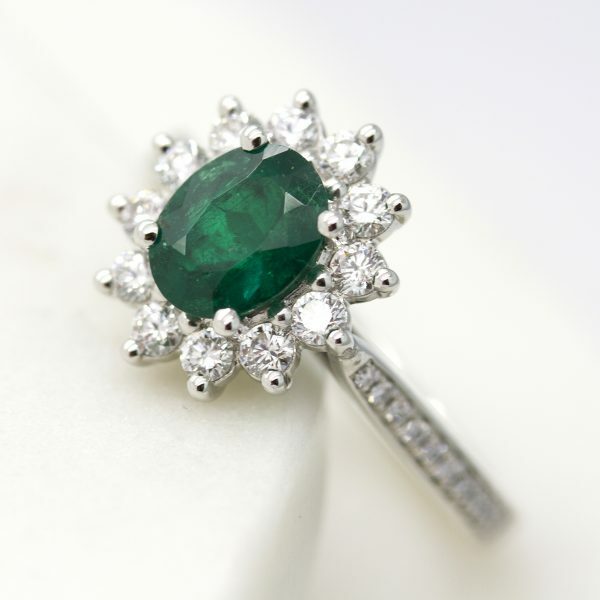 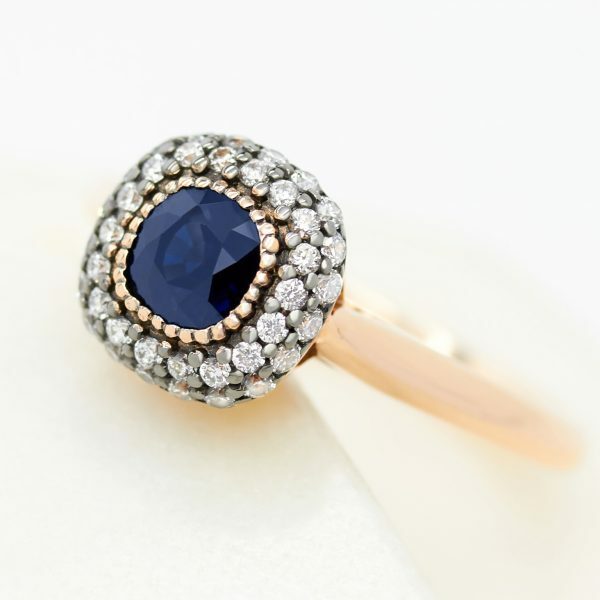 For example, you could choose a traditional solitaire ring but have a small gemstone set inside the ring’s band. 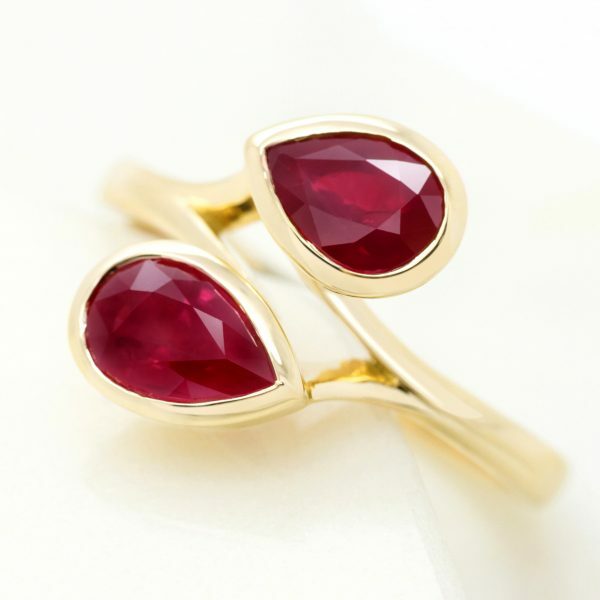 We include a signature ruby in each of our designs as a little secret between you and your partner. 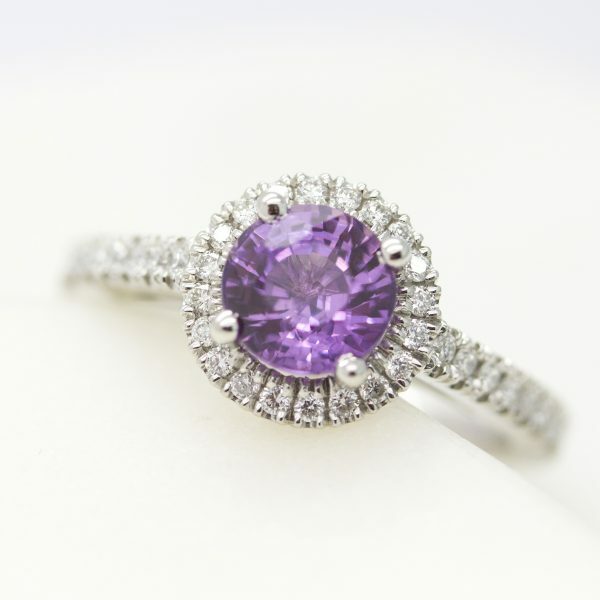 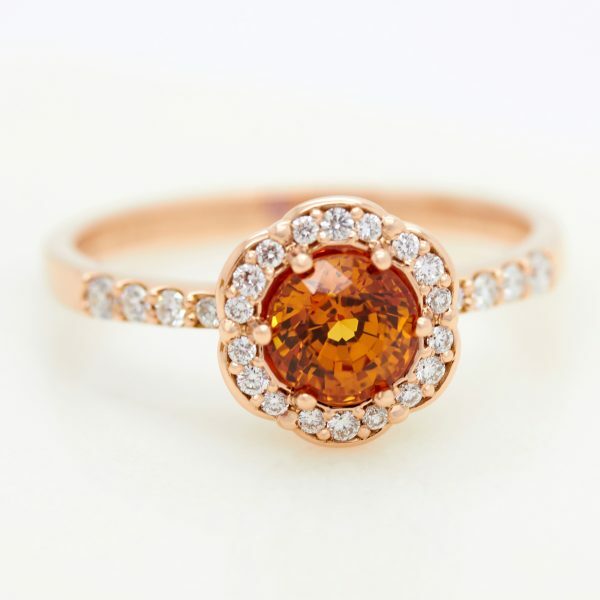 Many choose to set a different gemstone inside the band as a personal ode to their partner–either a favourite colour or a birthstone. 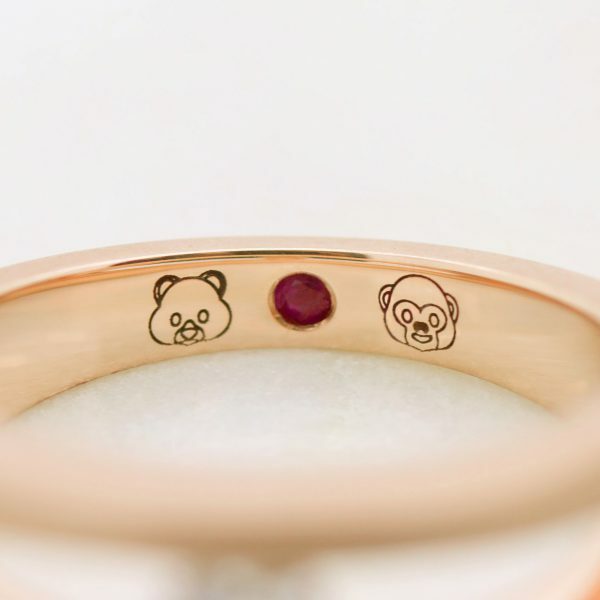 Or choose a pre-designed ring from our collection and make it entirely one of a kind by having a personalised engraved inscription with a special message, date, pet name or even emoji inside the band. 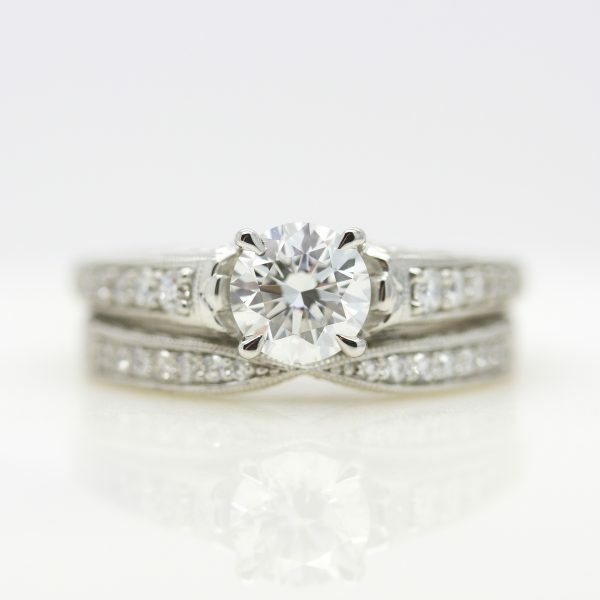 These small, yet poignant personalizations add a level of custom that ensures your design remains a unique engagement ring. 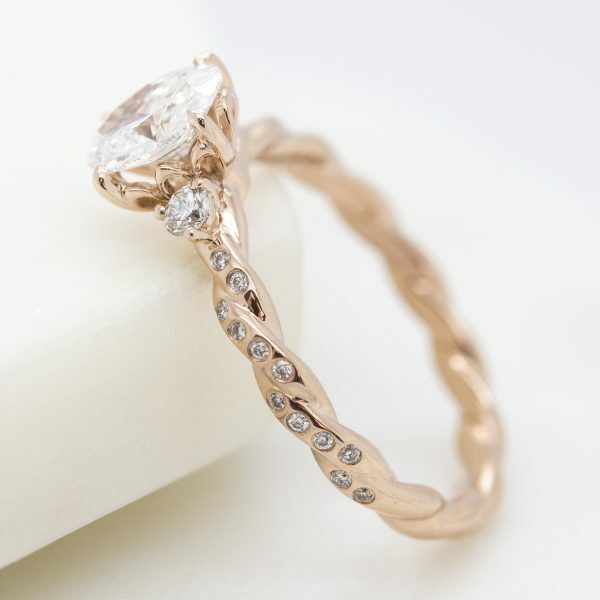 The next category of “unique” engagement ring design is a customised design. 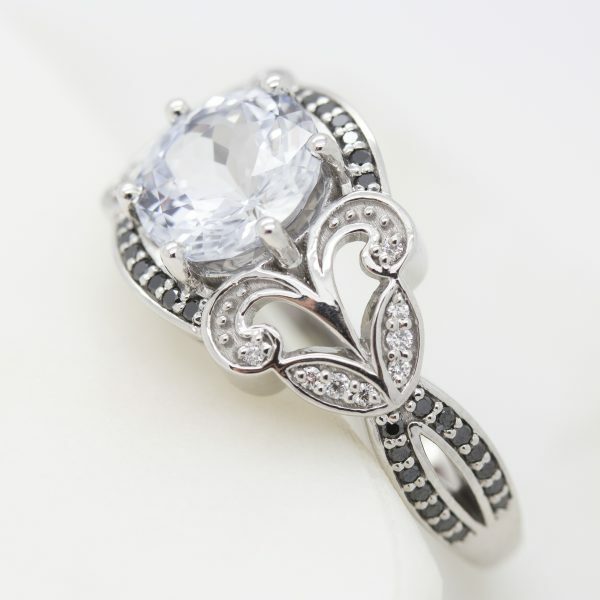 This is taking an existing design, be it one from our collection or a design you’ve seen elsewhere, and making a change or customization to an element of the design. 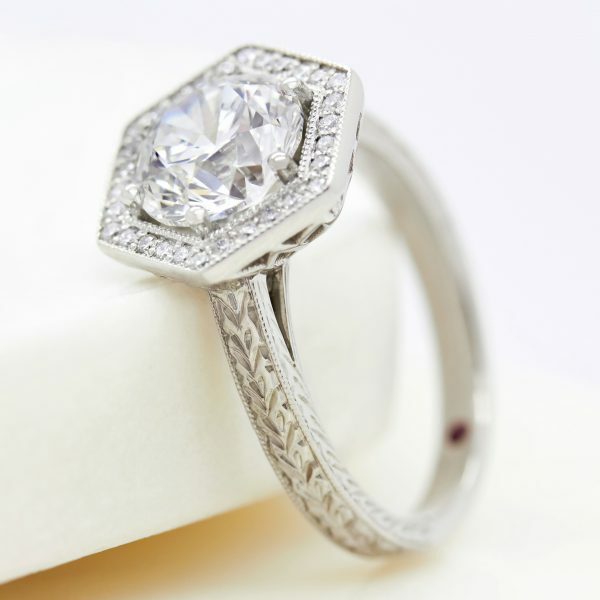 For example, this could be taking a halo engagement ring style you’ve seen and increasing the melee stone size-they’re the stones in the halo and on the band itself. 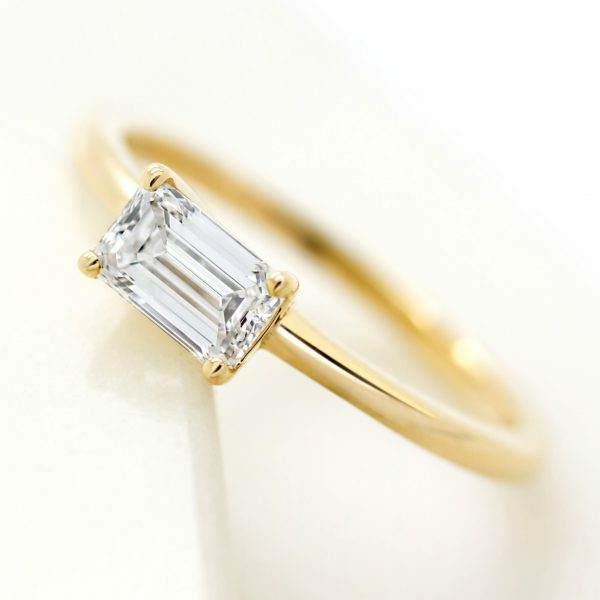 This would mean perhaps increasing the thickness of the band and overall carat weight of the diamond melee. 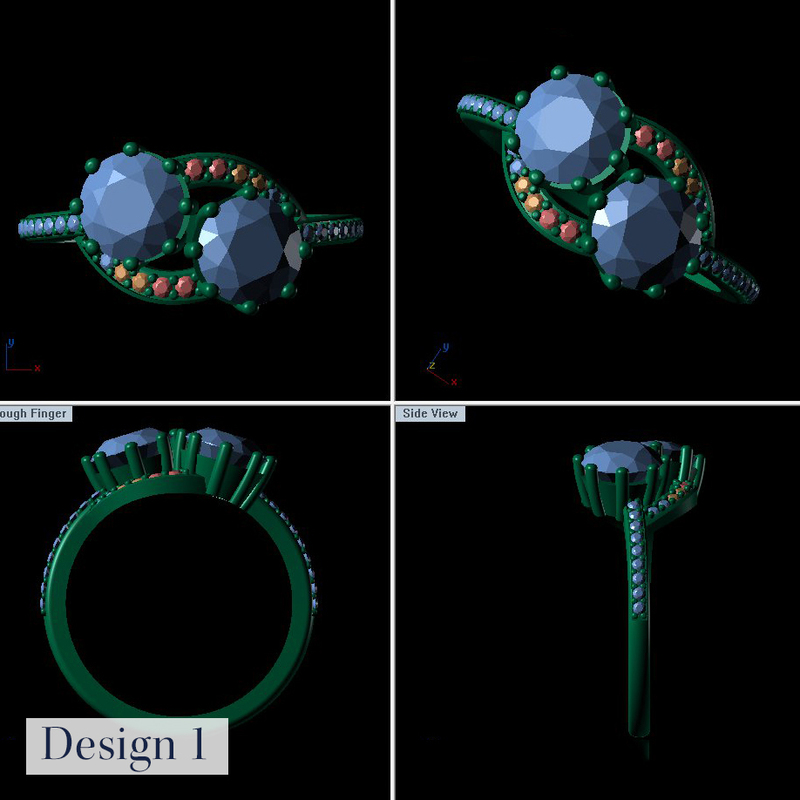 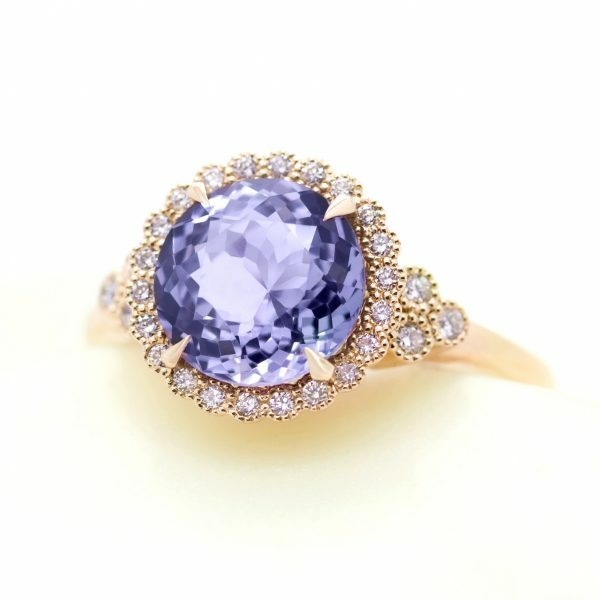 Or instead of increasing the melee stone size, change the centre stone from a diamond to a coloured gemstone, as shown on our Entwine design below. 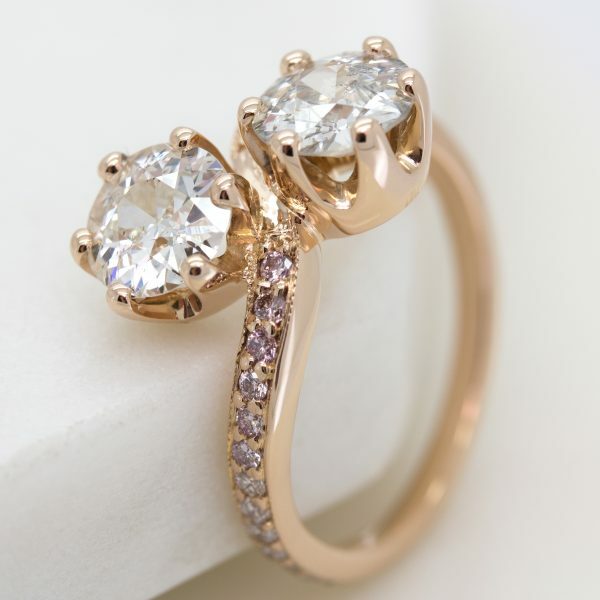 This category doesn’t mean your design is crazy out-there, although it can be. 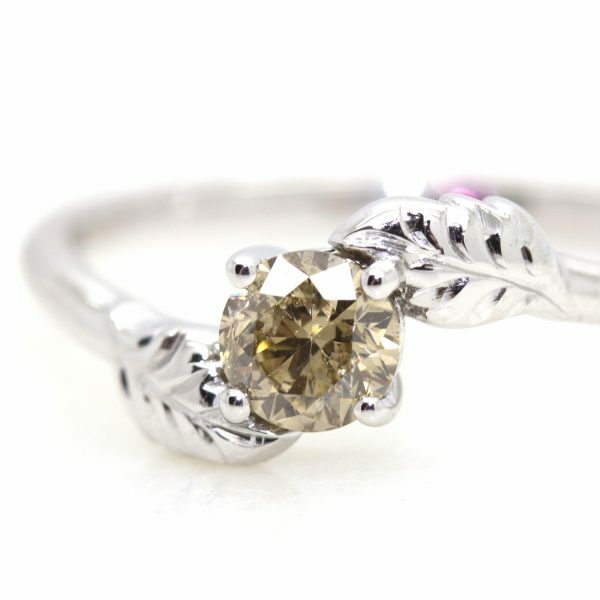 It can be a design combined of elements from lots of other designs, or a ring based on a sketch or moment, holiday or interest you’ve experienced together. 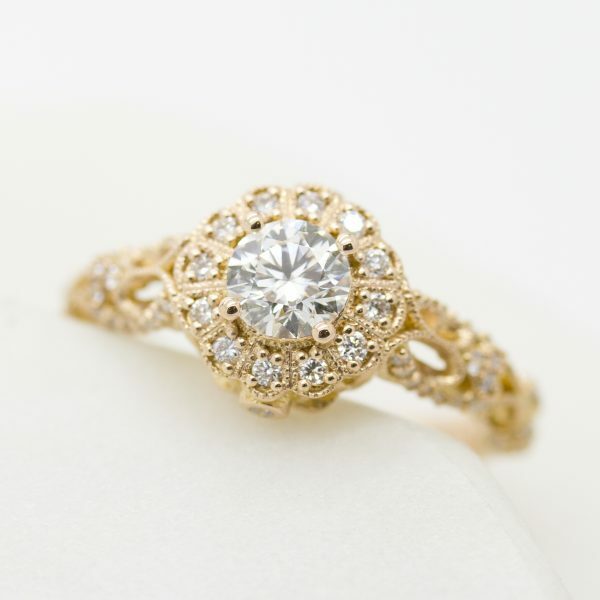 Browse through our gallery of unique engagement ring inspiration and schedule your consultation where you can design an unusual or unique engagement ring of your own. 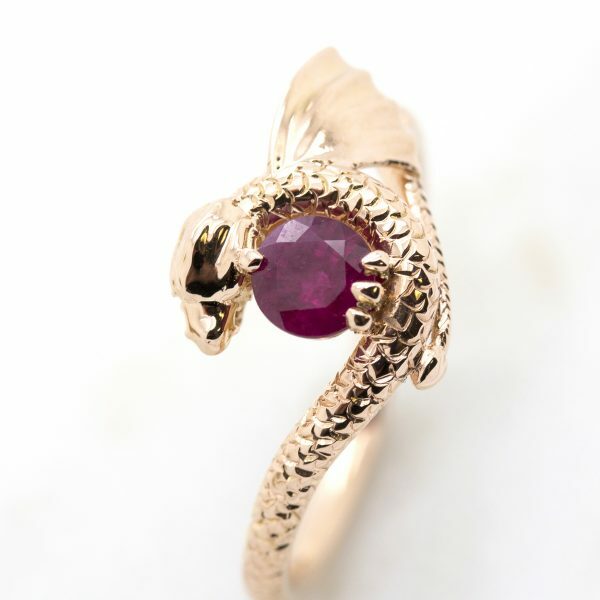 The inspiration for the ring design came from their relationship and the continual occurrence of dragons in their life together. 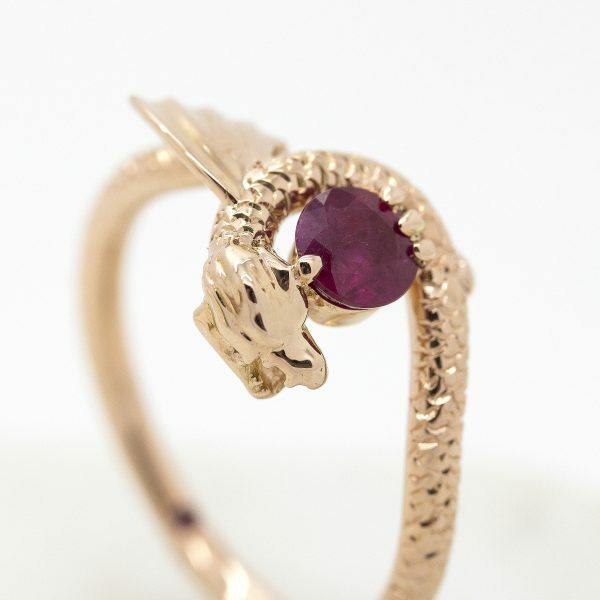 The mythical creature inspired design was paired with a proposal on top of a volcano – a truly epic love story. 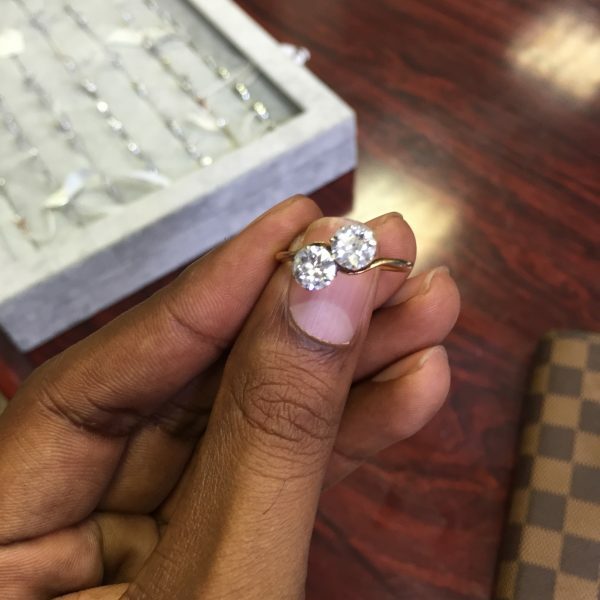 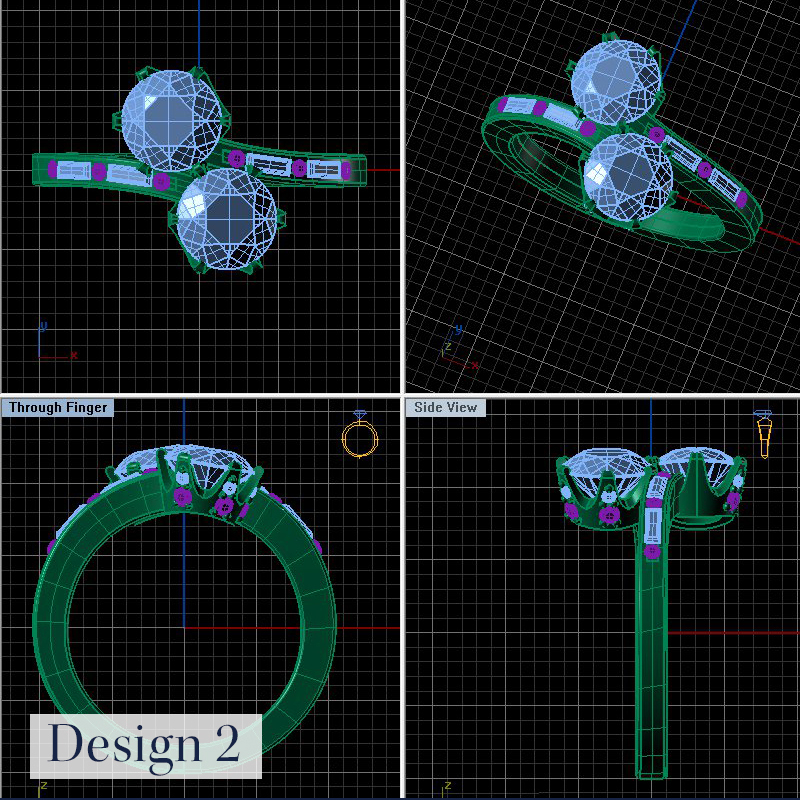 Andras came to us with a very clear idea of the ring design he was looking for. 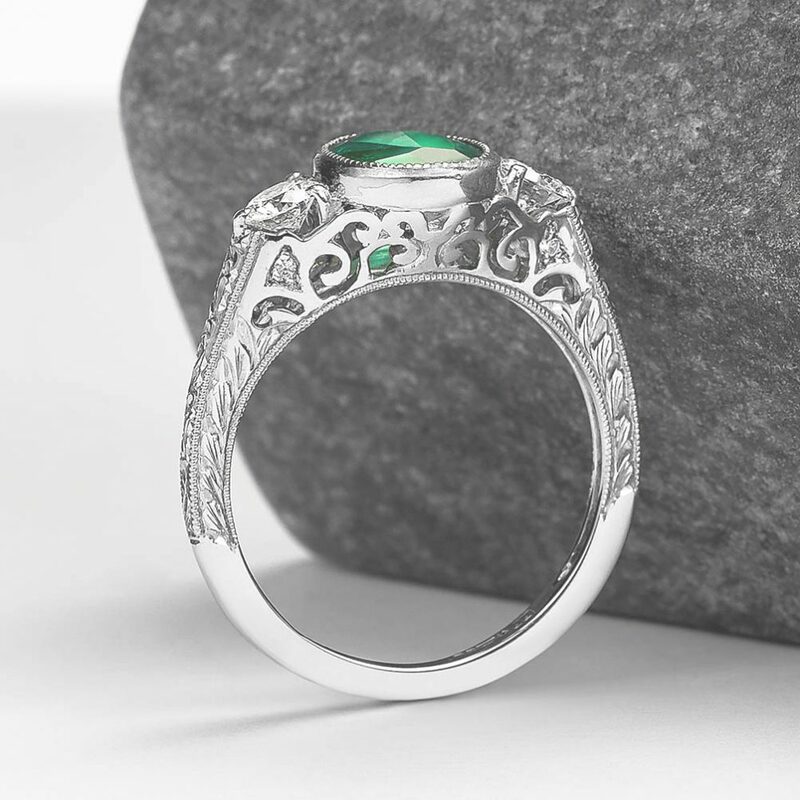 He created the design in a sketch himself and his design consultant took it from there by adding some technical aspects to the design and suggested the engraved scales on the band to add a little extra detail and texture. 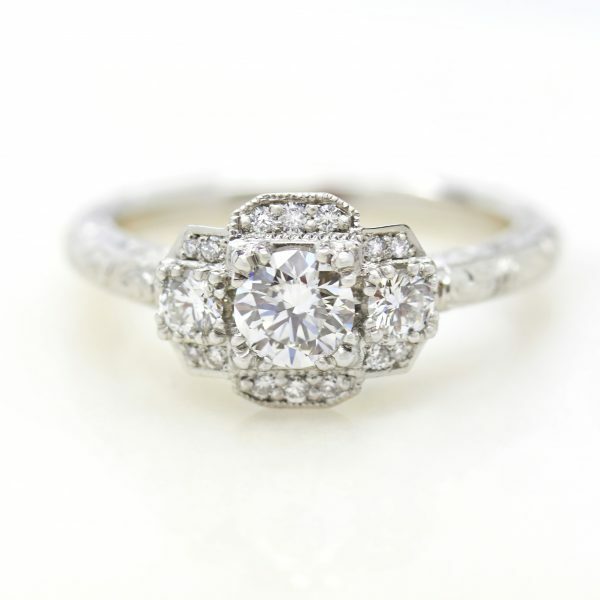 His design consultant suggested the entire design remain vintage-inspired while still using modern materials. 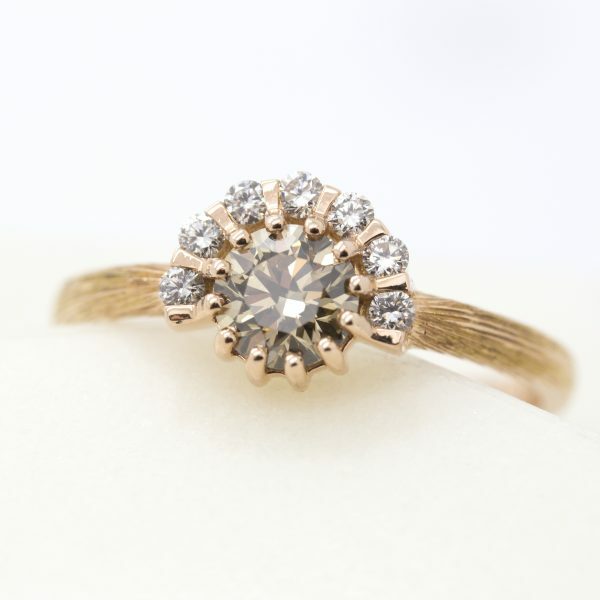 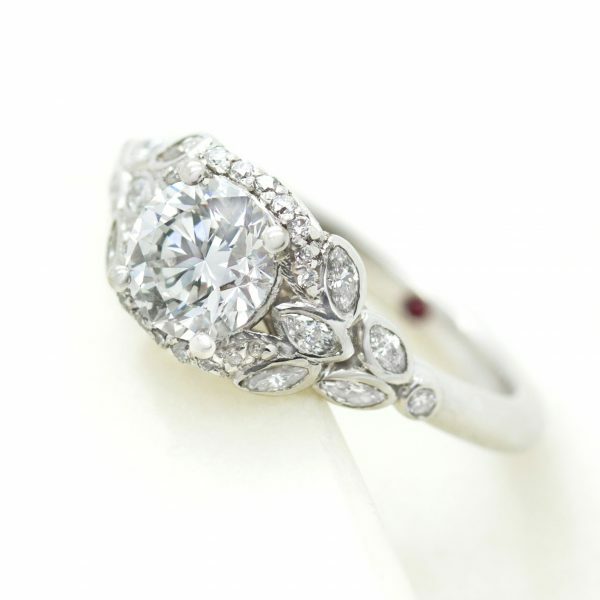 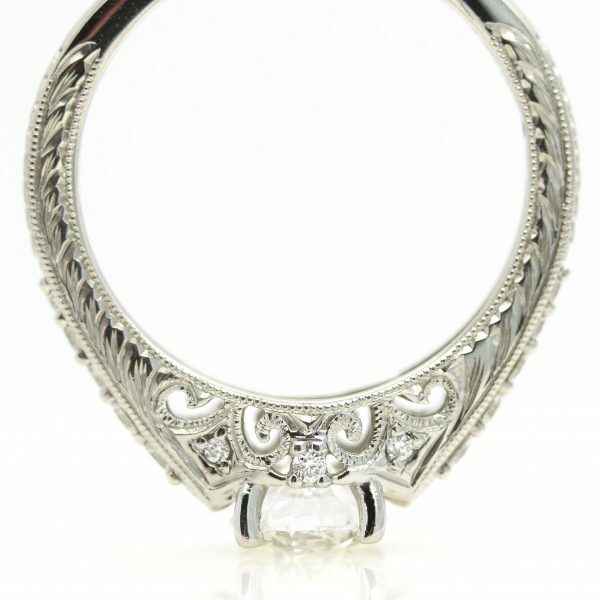 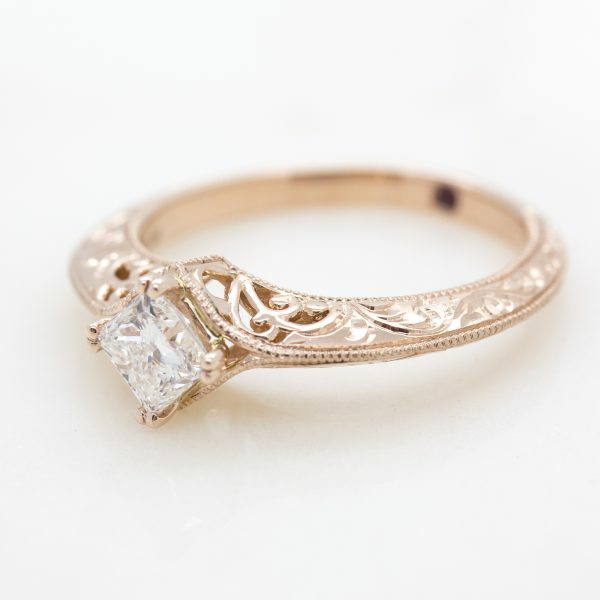 Crown setting, bead-setting and milgrain are all typical design elements of the Edwardian era. 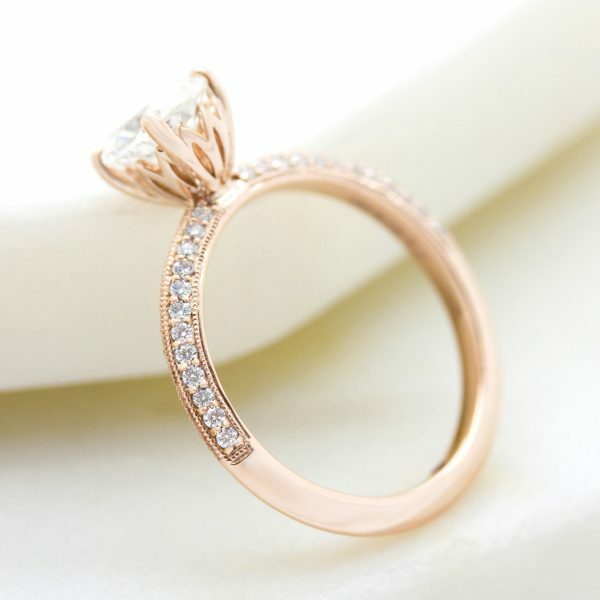 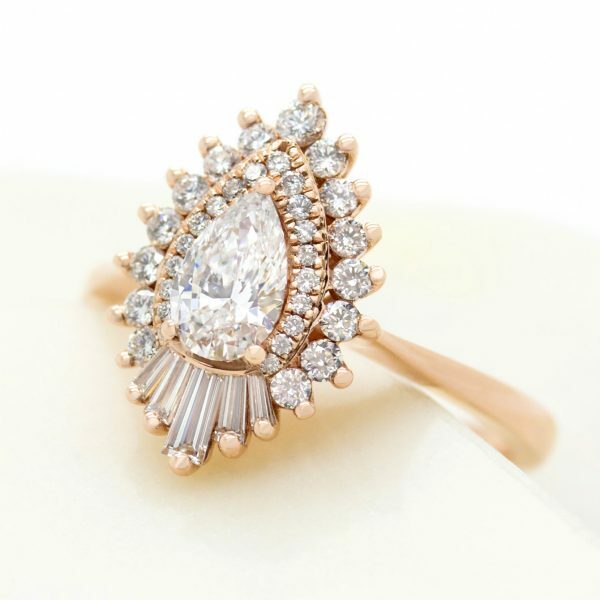 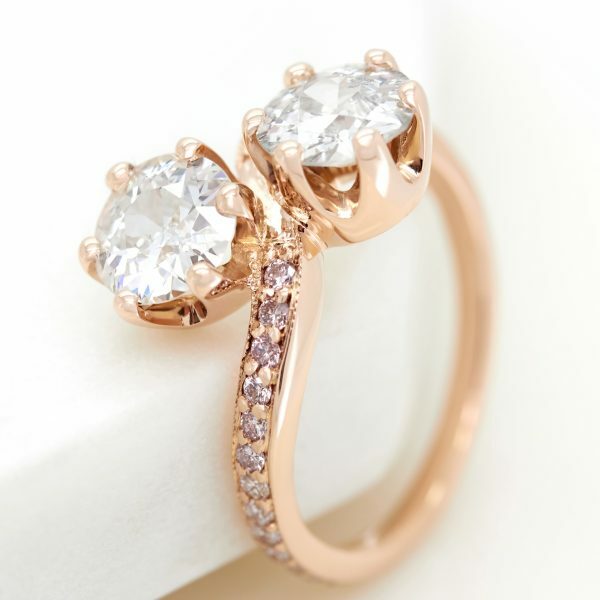 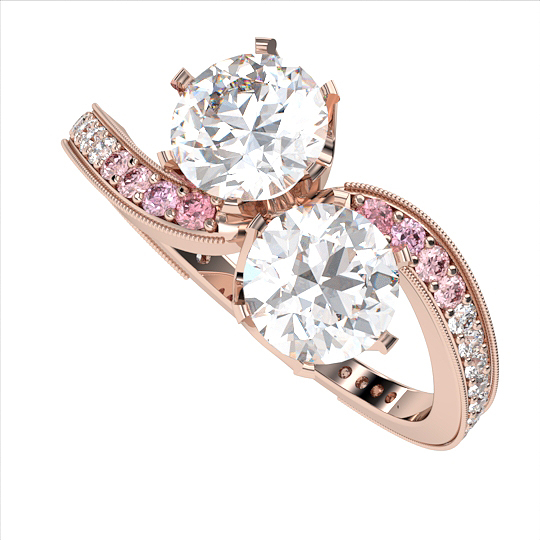 Stuart mentioned that his partner loved pink and the idea was born to use pink diamonds and 18K rose gold. 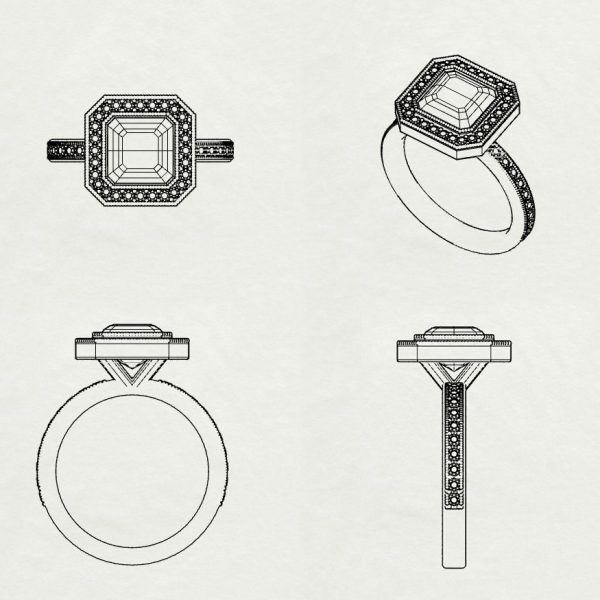 Presented with four designs, Stuart took elements of each design to arrive at the perfect engagement ring. 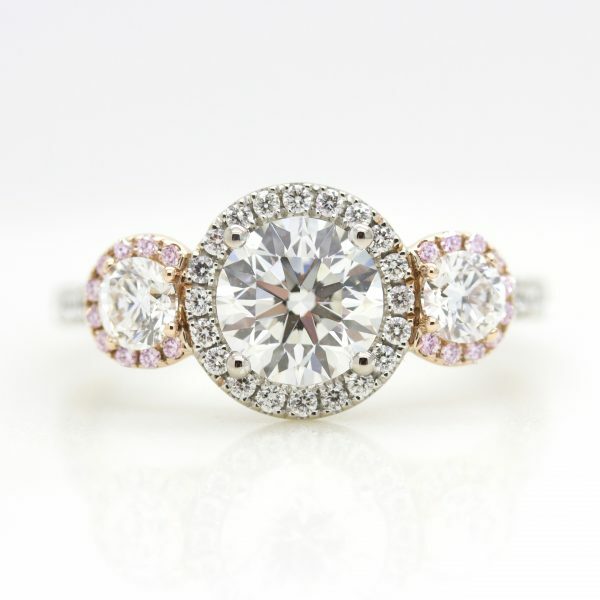 Bead-set pink diamonds transitioned into white diamonds to create a stunning ombre effect in between the two old-European cut diamonds. 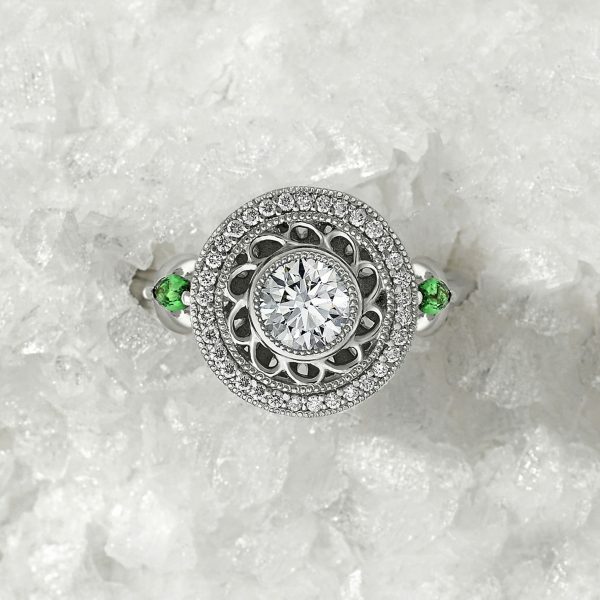 Repurposing a family heirloom is a great way to combine both sentiment and style while retaining an entirely unique design. 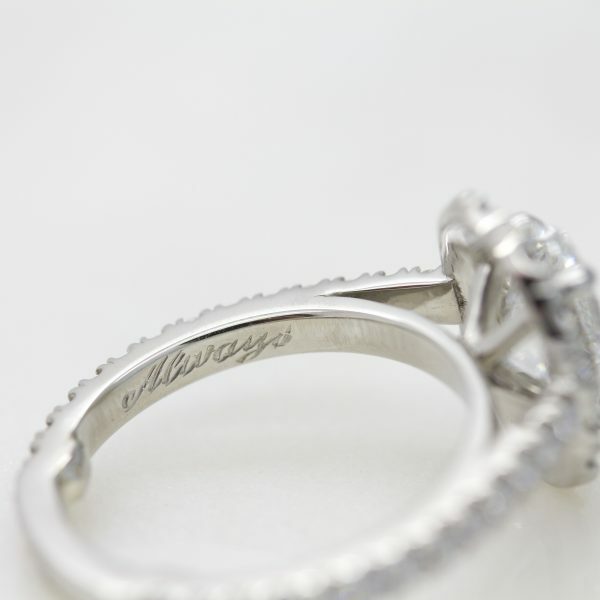 Ali got in touch with us to design an engagement ring for his then girlfriend, Shannon. 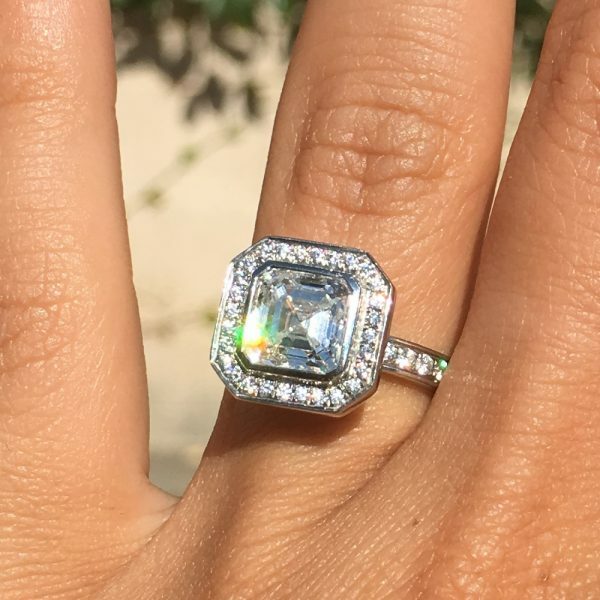 My fiancée had a ring design Pinterest board, so I snooped on her Pinterest to see what kind of designs she liked. 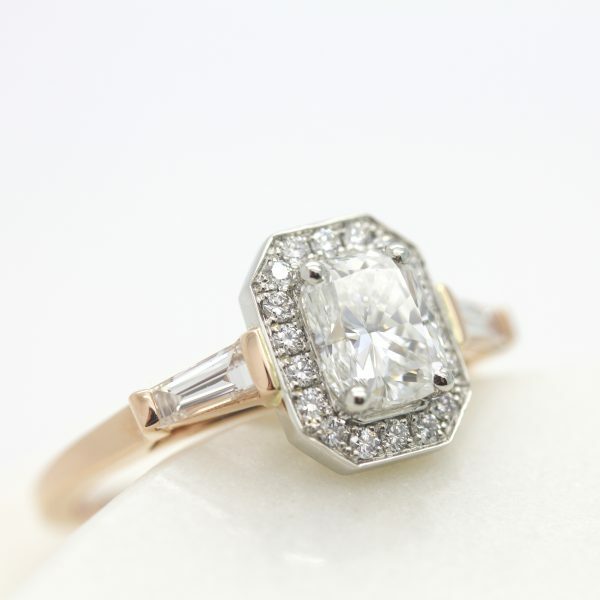 Based on what she was looking at, she wanted an Art Deco style, but I decided to deviate from the original shape, to put my own personal twist on the design. 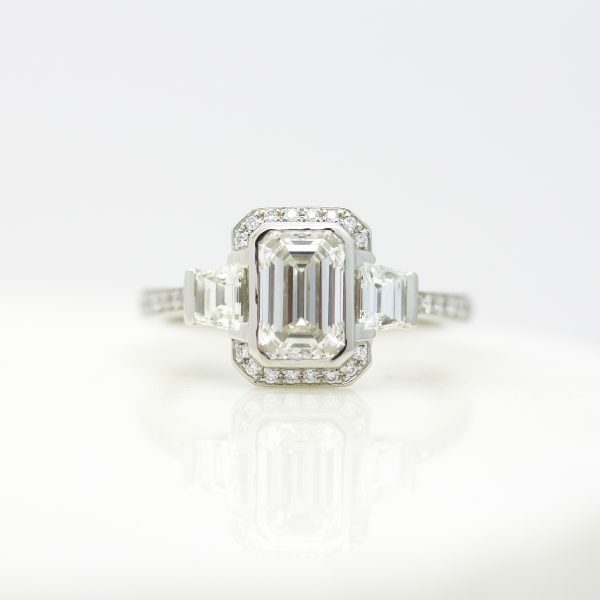 I chose an Asscher cut diamond instead of an emerald cut just to make it something unique, something that I’d had an input on. 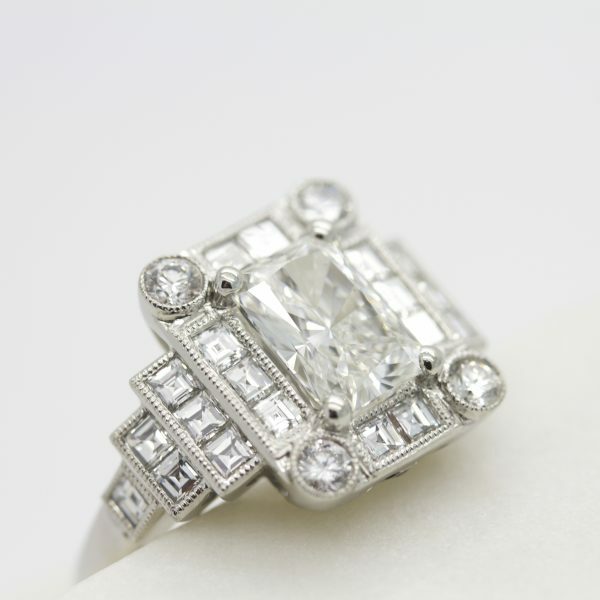 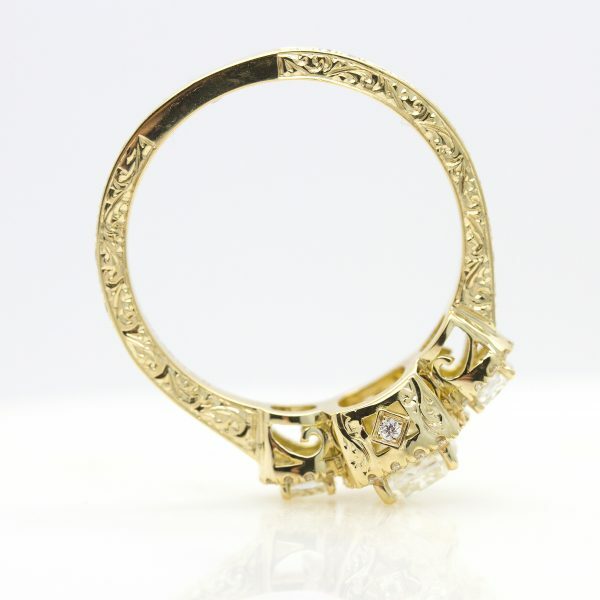 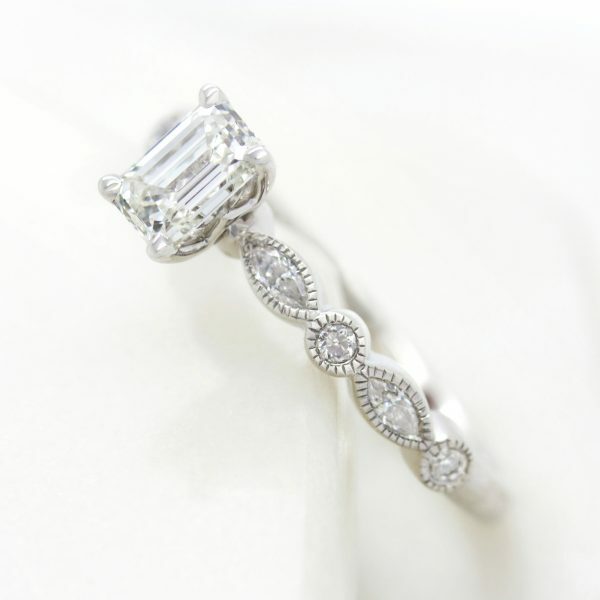 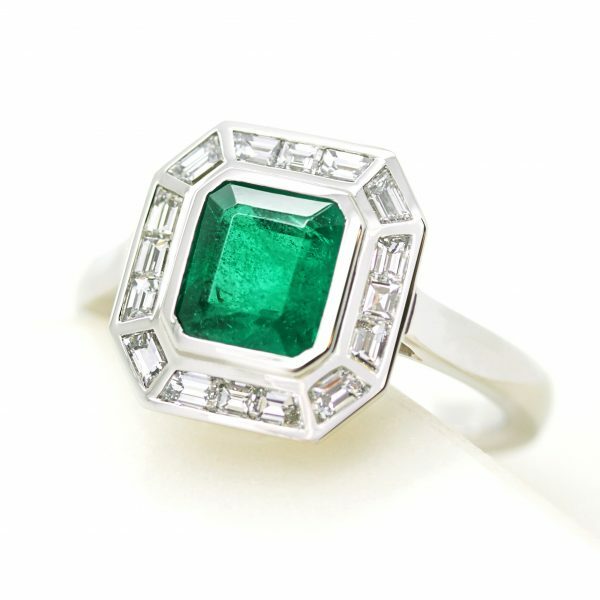 Ali made this classic Art Deco design his own with a small customisation that made his unique engagement ring entirely personal.